Premium Japanese beauty brands have long held a firm spot in the cabinets of skincare lovers worldwide. An interesting combination of scientific innovation, mother nature’s wonders and century-old wisdom, the Japanese beauty philosophy goes more than skin deep — to call it a form of wellness wouldn’t be too far off the mark. Rather than quick correction of damages and superficial cures, the products focus on anticipation and prevention. As Japanese beauty rises in popularity, some of the top brands are finally setting foot in Thailand — among them is Menard. In Japanese, Magokoro means “a pure heart with no deception or facade”, or “to put your heart in a gift.” It speaks of devotion and sincerity — an approach Japanese beauty brand Menard has continuously upheld over the past 60 years. Following a philosophy of “seeking true beauty”, Menard prides itself for quality and personalised service, with face-to-face skincare consultations for regimes tailored to the individual. 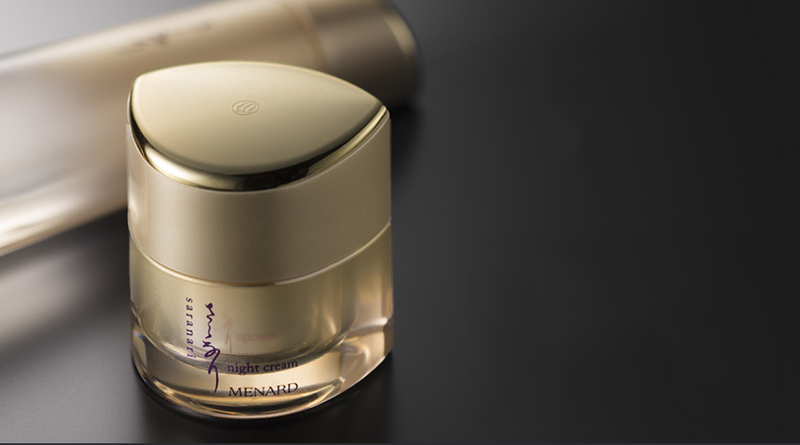 With a variety of lines from the Saranari to the notably rejuvenative Embellir set, Menard’s products offer a simplified yet cutting-edge approach to beauty and skincare. Known for its restorative effects, the Embellir Set uses red reishi and black reishi extract to rejuvenate and firm up the skin. With intensive invigorating properties, the set conditions the skin to a natural softness, making it velvety to the touch. The regimen is quite comprehensive, with Washing, Refresh Massage, toner, liquid, an anti-aging Embellir Extract serum, as well as day, night and eye creams. Maybe you haven’t got the time, the energy, or the memory for an extensive skincare regime. If that’s the case, get Authent. A single cream product that offers comprehensive results, Authent permeates the skin smoothly for a soft and supple texture. The easy blending and quick absorption also make this an ideal choice. The Saranari set offers a firming effect, resulting in skin that glows with fresh moisture. Texture-wise, the products are creamy and easily applicable. The line uses hydrating ingredients such as zymomonas ferment extract, as well as GL II extract to replenish the skin with moisture, as well as improve skin elasticity — hence, the firming results. Packaged in pastel pink and white, the Lisciare set gives off the fresh aroma of viola thibaudiere flowers, a key ingredient in the products. If you’re concerned about your skin getting rough or darker from exposure to UV rays, this line provides an ideal solution, using high water density and twelve varieties of oriental plant extracts to help brighten and moisturise your skin. If you’re having issues concerning overly dry skin, rough skin, grease particles or black heads and such, opt to add Beauness to your skincare regime. Use it after washing your face as a basic treatment to help maintain healthy skin, as well as provide a preparatory base before other skincare products are applied. The product comes as a transparent, watery liquid that absorbs very easily to the skin, leaving it supple and fresh. Idea for those who are struggling with acne, small pimple breakouts, or even irritable areas. Menard is now imported and distributed in Thailand by Luxicon Beaute Company Limited. You can find the products in Siam Takashimaya at Iconsiam. For more information, visit menard-cosmetic.com.